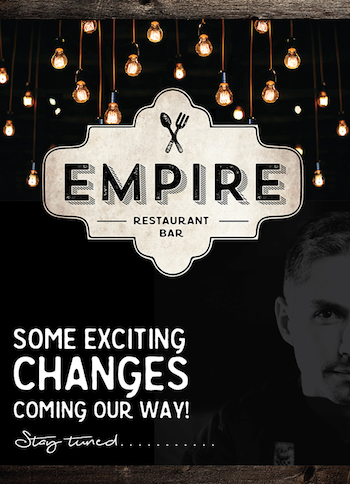 FEB 25 15 — Careful observers in the ByWard Market may have noticed signs in the window at Empire Grill, at the busy corner of Clarence Street and Parent Avenue, announcing renovations underway until March 15 when it plans to reopen under the name Empire with a new menu and head chef. Look carefully, and you’ll spot chef Norm Aitken’s face in the background (photo, right) of the announcement. Yes, turns out Norm, 36, a graduate of the Culinary Institute of Canada in Charlottetown, will be running the Empire kitchen with sous chef Line Lefebvre and chef Ismail Labaalli. Recall that Norm was a partner in the popular Juniper Kitchen and Wine Bar in Westboro, which closed after 17 years citing tough economic times. Line will be joining him at Empire from the former Juniper ranks. Ismail was at Empire before renovations. Norm says he’s looking forward to earning a regular paycheque (as opposed to shouldering the responsibility of ownership). “It’s a bit of a relief to be honest, not having the pressure of having to be on social media every single day because you have to promote your business,” Norm says, in an interview today. “In this market, if you’re not on top of social media you’re going to slide real quick. “As owner, I’m responsible if the fridge isn’t working, when a light bulb needs changing – every day I had a list of 45 things to do, and if you didn’t get it done it’d be back on the list tomorrow. Every day it was something new, and it was just too much. Norm says he was approached by owners of The Empire Group of restaurants soon after he and former business partner, chef Peter Robblee, shuttered Juniper last autumn. They had a plan to rebrand Empire, and asked if he’d be on board. “We all get along,” Norm says. “We met back in December and hit it off within an hour. We’re all on the same page. I need a marketing department to take care of marketing while I just want to be left alone in the kitchen with my crew. Let’s just focus, cook great food, and that’s it. Ron Eade: Norm, you closed Juniper Kitchen and Wine Bar in Westboro in November, ending a 17-year run, citing tough economic pressures. What have you been doing since? Chef Norm Aitken: Hanging out with my girls, going to Mexico for a week for some sun, and then working on this project. Eade: How did this come about for you with the Empire Group of restaurants? Aitken: Within days of closing Juniper, Dave Mongano of The Empire Group left me a Facebook message saying they’re planning changes … and wondered if I’d be interested in taking on the rebranding. They wanted to completely change the feel and direction of the Empire. 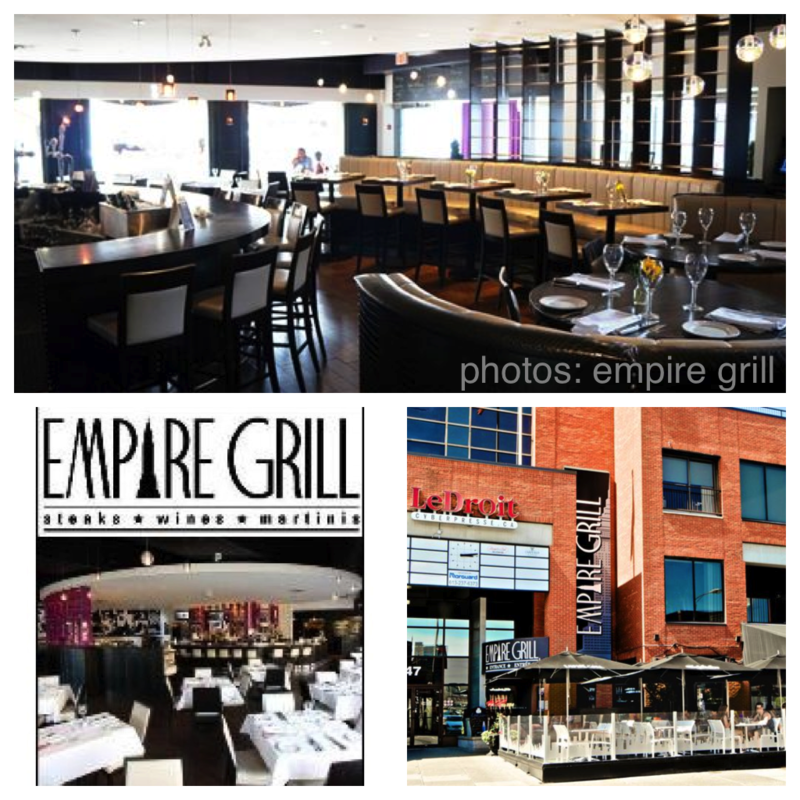 Eade: The Empire Grill has been around 17 years, most recently as a higher-end chophouse with seafood. How is that going to change? Aitken: It’s definitely not going to be a steak house like it was. We’re in the heart of the ByWard Market, so it’s about appealing to a wider range — from families with kids to tourists, business clientele. While we’re still in the hub, we need to appeal to a broader demographic. Eade: How will the price point change? I think the $100 per person after taxes, tip is becoming a more difficult sell these days unless you have a specific, targeted niche willing to pay. Aitken: At Juniper I was running a $60 or $65 cheque average per person, plus tax, tip, drinks, so you’re going to drop $100 per person. We’re going to try and cut that almost in half. The menu design will be a one-pager, I’m not changing the menu from lunch to dinner. A lot of the items will be smaller, composed vegetable side dishes. I’m still going to keep three steaks on the menu — a tenderloin, a strip loin, and something with bone-in — because that’s what it is and there’s a still a clientele that wants it. I’ve been hanging around there a couple of weeks now and it’s amazing how many steaks they pump out. I also have really good seafood connections on the East coast I plan to use. Eade: So where is the Empire going with this? Aitken: I guess they’re going to take on a concept that’s a little more transient, because that’s who are in the Market right now — people are moving, they want more variety. Am I going to say it’s small plates? No. I have a very large bar menu, I have a raw section, I’ve got what I call in-transit — very quick items to put up, bite sizes. I’ve also got a sharing portion of the menu because people want variety. Eade: John, what’s your vision for the Empire? 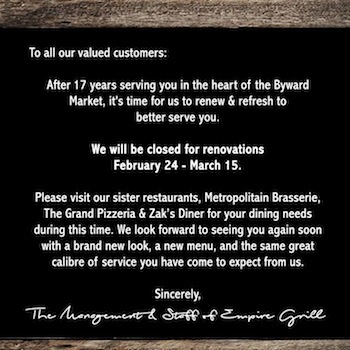 I understand it’s to open on March 15 after renovations under the name Empire, no longer Empire Grill. John Borsten: We opened 17 years ago and really nailed it at the time, changing the ByWard Market dining scene. It wasn’t really a steak house at the time, it was an eclectic menu — I think we had chicken wings on it, at the time — and the patio of course was great. There was fine dining elsewhere at the time, then there was Zak’s Diner, and Empire Grill sort of slid in the middle. We didn’t have the tablecloths then, it was a much a more casual, upper-casual place, and it was massively popular. 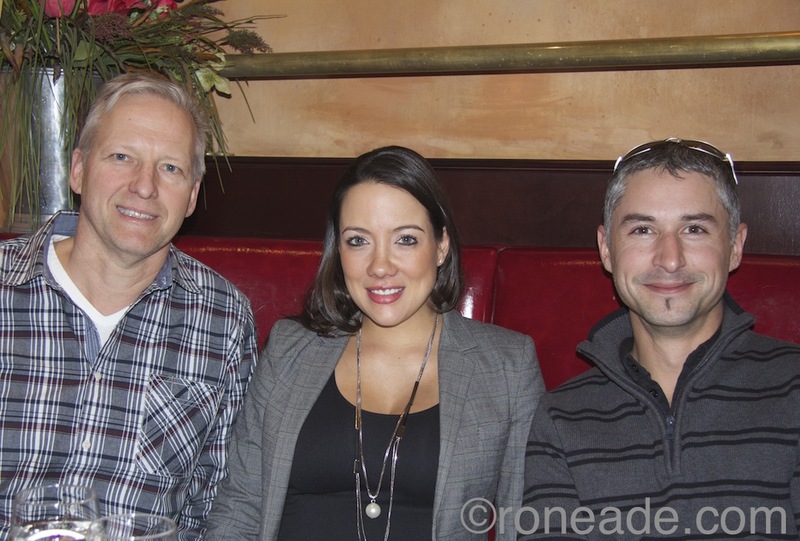 We had the dot-com clients with martinis, which came and went. But we never aspired to be a fine dining place. We sort of evolved over the years with steaks, which dominated the menu because we did them so well, which raised the price point. Then we started going toward the steak house motif, then tablecloths came, and it did well. Then 2008 came and there were budget cuts in the city and people weren’t dining like that any more. The tablecloths scared them. Eade: What is the price point that frightens people away? Is it $100 with tax, tip and drinks? Borsten: There was a price range, and the steaks were great. But you have to pay for that. When we pay $15 for a steak then we’ve got to charge two or three times that, that’s how the restaurant business works. So we’re talking $30, $40 for steak, and that makes it an easy $100 meal with a couple of drinks. It worked for awhile and was good, but at that location in the ByWard Market — it’s big, with 300 seats with the patio — we need to appeal to a bigger range of people. We get the suits sometimes, but there is not 300 suits a night coming in for dinner. So the plan going forward is to maintain the steaks, naturally, while the menu will be smaller plates, lots of $8 or $9 items, mix and match, and a greater range that runs all day with a variety of price points. You’ll be able to go have a beer with a pasta or some oysters with champagne, or a steak as you always had. Aitken: Someone who may come in the afternoon for a glass of chardonnay and two small plates could get away with $35 or $40 with tip and tax. Borsten: That’s sort of the life of a restaurant, it happens … It’s a tough business, restaurants are fickle. We’re changing because we’re not doing as well as we want, we’re not doing as well as we think we should be able, we want to update it. That location is just too good not to do big business. Eade: You invested $1.2 million to open The Grand pizzeria in 2009, and more than $1 million for the Savoy in 2012 (Savoy now owned by former Empire partner Gary Thompson). How much are you investing this time around? Borsten: This is like our fourth renovation. This is more cosmetic, so it’s $300,000 to $400,000 by the time we’re done. The kitchen was renovated two years ago, the infrastructure is all there. It’s all new furniture and a completely new look, more earthy and warm. Aitken: People can expect the same kind of food direction that we’ve always done at Juniper. We came up with the term Crafted Canadian. I don’t like the term ‘contemporary’ because I think it sort of files me into a pretentious corner. But we are in Canada, it is minus 30 degrees out there, so there are realities to deal with. We’re all classically trained and that’s not going to change, so we take it and spin it around a little. The fundamentals of cuisine remain the same, but how we pair flavours and deliver it may differ. Borsten: We’re still working on the menu, which we just tore apart yesterday. The whole menu will be a rebuild; the only thing we’ll retain will be steaks, the same quality of meat – Certified Angus Alberta Reserve, aged two months. Aitken: Within a week we’re probably going to get in and start pinning down recipes. Eade: Is what you’re doing going counter to the experience of restaurants these days? We want to reboot. You have to do that every 10 years in the restaurant business anyway.